Karl Lagerfeld, best known for being creative director at three of the biggest fashion houses in fashion: Chanel, Fendi and his own label has made diet coke the new must have accessory. The design is quintessentially directed towards us lovely ladies, with stars,dots and stripes on the pink and white bottles (seen below). However, we wont be able to get our hands on this new accessory until at least June. 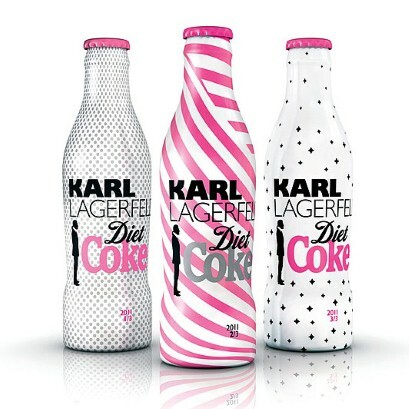 This is the second ‘collection’ Lagerfeld has designed for the limited edition bottle of diet coke and his predecessors included Marni and Roberto Cavalli. Who would have thought fizzy juice could be so stylish?! Great idea don’t you think? TellusFashion are also loving the little Lagerfeld on the side too! This entry was posted on March 29, 2011 by Heather Mhari. It was filed under Fashion and was tagged with chanel, Diet Coke, Fendi, Karl Lagerfeld, Marni, Roberto Cavalli, TellusFashion.